Above: Taos Ski Valley lends its scenic setting to an active wine weekend. Photograph Courtesy Taos Ski Valley. Each summer, Taos Ski Valley is gloriously carpeted in wildflowers—and blessedly absent the throngs who flock there all winter. 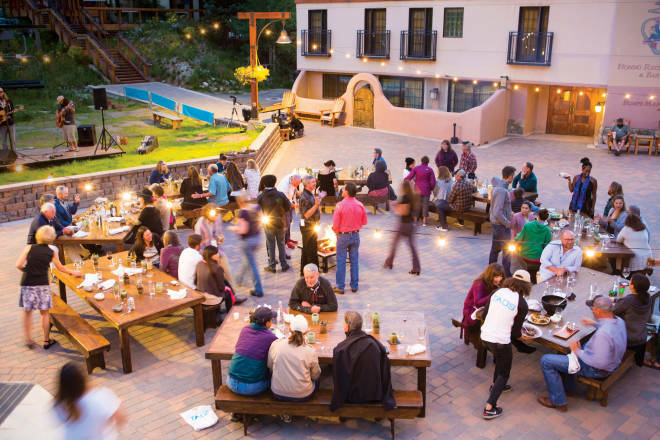 The resort is a sunny, cool, peaceful paradise in August, when this three-day festival blends wine tastings, intimate dinners, enlightening seminars, and outdoor activities. The inaugural event, last year, had the feel of a high-end summer camp for epicures, kicking off Friday night with a wine-pairing dinner on the resort patio, served family style at picnic tables as a mellow band played from a stage near the base of Lift 1. Saturday morning dawned with breakfast at the Blake hotel’s restaurant, 192, followed by yoga on the patio, a chocolate-and-sherry-pairing class, and a mushroom-foraging hike. The Bavarian Lodge hosted a pig roast at lunch, and the grand tasting unfolded on the resort patio, with dozens of international and local wines, beers, and a few spirits. Between meals, attendees took advantage of horseback riding, fly-fishing, and hot-air ballooning events. Champagne brunches closed the event Sunday morning. The best way to experience the festival is with one of the ticket deals that packages two nights at the Blake, the resort’s centrally located luxury hotel, with all the meals, tastings, and events offered Friday–Sunday. Day tickets and weekend passes without lodging are also available (see skitaos.com for current package details).